Spring brings with it a sense of rejuvenation and coming back to life after the winter. However, in the vast nation of India, where the climate has only three main seasons (winter, summer, and monsoon), spring is largely based on Vedic astrology and a season on the Hindu calendar rather than a change in weather. Hence, many of the spring festivals in India have religious reasons behind them. Others have agricultural significance. In accordance with the Hindu calendar, spring in India runs from around mid February to mid April, and is known as Vasant (or Basant). The vernal equinox on March 20 or 21, which marks the beginning of spring in the northern hemisphere, occurs midway through Vasant. These popular spring festivals all provide unique experiences for appreciating Indian culture, including the country's lesser-known tribal culture, and are great reasons to visit India at this time of the year. Vasant Pachami marks the beginning on spring on the Hindu calendar and is considered to be an auspicious day for new beginnings such as starting a new business, getting married, holding a housewarming ceremony, or other important work. It's celebrated across India in various ways depending on the region. Yellow, which represents the brilliance of nature, widely features in the festivities. In the agricultural state of Punjab in northern India, people dress in yellow to match the yellow mustard fields in full bloom. Goddess Saraswati, the Hindu goddess of knowledge and the arts, is also worshiped on this day. The Khajuraho monuments are a series of historic temples located in Madhya Pradesh state, and this renowned festival allows visitors to see displays of a range classical dance styles that are found in India. The festival is held for a week in late February every year against the backdrop of the temples. In Mizoram, in Northeast India, the popular spring festival of Chapchar Kut celebrates the completion of bamboo harvesting. The festival features a skillful bamboo dance, called cheraw, that's performed by women to the accompanying beat of bamboo sticks. Other attractions include various styles of tribal dance, traditional costumes, and a fair with handicrafts and food. When: During the first week of March each year. The fascinating annual springtime festival of the Apatani tribe in the Ziro district of Arunachal Pradesh is conducted for purification, prosperity and fertility. It has many cultural elements such as folk performances, processions, and rituals carried out by the village shaman (priest). When: March 20-30 every year. The most interesting days for visitors are the second, third, and fourth days. The arrival of spring in the state of Goa is marked by the Goa Carnival, which the Portuguese started in the 18th century as a local feast just before Lent. It's now the state's most famous event, with colorful street parades and a formal ball. 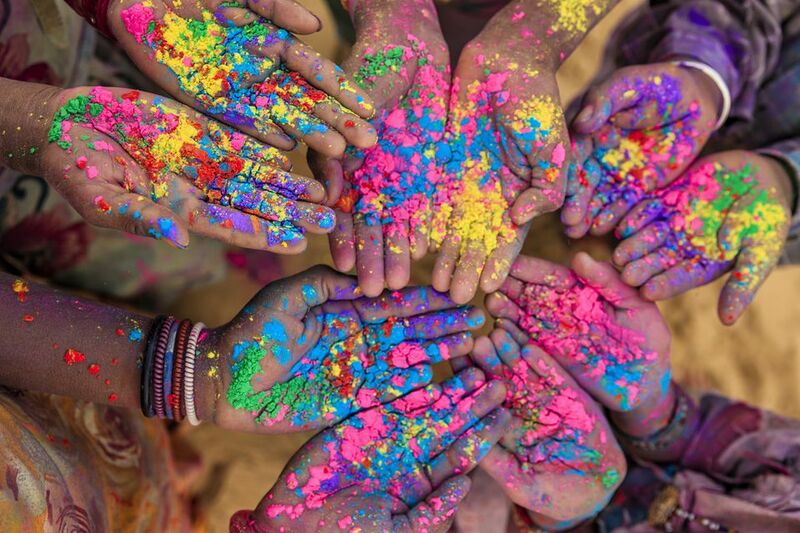 This festival is one of the best known outside of India, and it is often referred to as the Festival of Colors. People celebrate by joyously throwing colored powder on each other and squirting each other with water guns. At the end of the day, everyone is covered in a brightly colored mixture. These fun activities are related to Lord Krishna, a reincarnation of Lord Vishnu, who liked to play pranks on the village girls by drenching them in water and colors. The festival is also centered around the story of demoness Holika, who was burned to death with the help of Lord Vishnu. An important spring festival in Rajasthan, Gangaur is held to celebrate wheat harvest in the state and to honor the goddess Gauri (an incarnation of Parvati, Lord Shiva's wife). It starts the day after Holi, when the ashes gathered from the fires are used to grow seeds, and continues for 18 days. Women worship decorated statues of the goddess and carry them out in procession to be immersed on the last day. The biggest processions take place in Jaipur and Udaipur. After the sowing of seeds is done, the infamous headhunter Konyak tribe of Nagaland's Mon district celebrate their spring festival with a great deal of merriment. Dressed in their traditional costumes, they sing, dance, drink, and eat throughout the day and night. A special rice beer is brewed in advance and consumed in excess. When: April 1-6 each year. This harvest festival of the hospitable Galo tribe in Arunachal Pradesh involves the worship of goddess Mopin to get rid of evil spirits and bring prosperity. Young women perform an indigenous folk dance called Popir. Traditional rice wine (apong), prepared by Galo women, is also served. When: April 5-8 each year. One of two annual Navaratri festivals in India, Vasant Navaratri starts on the first day of the Hindu lunisolar calendar (on the new moon following the equinox) and is known as the holy nine nights of spring. The festival is mainly celebrated in northern India. Different forms of Shakti (female energy) are worshiped on each day to seek the blessings of the divine mother goddess. The birthday of Lord Ram usually falls on the last day. Gudi Padwa is the Maharashtrian new year, celebrated on the first day of Vasant Navami. The best place to experience it is Mumbai where a spectacular parade happens in the morning at Girgaum. It features sari-clad women riding motorbikes, floats depicting the culture of the state, and locals dressed in their finest traditional clothing. Ugadi is another new year festival that falls on the first day of Vasant Navami. It's marks the beginning of the new year in the Deccan region of India, particularly the states of Andhra Pradesh and Karnataka. Family meals are the highlight, with a traditional dish made of neem buds, jaggery, green chili, salt, tamarind juice, and unripened mango. Each ingredient is chosen to signify six emotions that people can feel. The annual Tulip Festival is a feature of spring in Kashmir. It takes place in Srinagar, where the largest tulip garden in Asia has more than 50 varieties of blooms. In addition to tulips, there are daily cultural programs, Kashmiri folk songs, traditional cuisine, and handicrafts for sale. When: During the first two weeks of April each year. Another lot of new year and spring harvest festivals occurs in India on the sidereal equinox, on April 13 or 14 each year. Baisakhi, celebrated in the agricultural state of Punjab, is one of them. This festival is particularly significant because it also commemorates of the founding of the Khalsa (Sikh religion brotherhood). Funfairs are common across the state, along with traditional bhangra music and dance. Major celebrations are organized at the Golden Temple in Amritsar. Bihu is the main festival of Assam, in Northeast India. This agricultural festival happens three times a year but the prominent celebration, known as Bohag Bihu or Rongali Bihu, starts on the sidereal equinox in April. This is seeding time in spring. The first day is dedicated to cows, which are vital to agriculture. The second day is spent visiting friends and relatives, along with plenty of singing and dancing. On the third day, deities are worshiped. Easter is celebrated in India, although the Christian population is a minority in the country. Many traditions seen throughout the world are part of the festival, including decorated eggs and Easter bunnies. Those who are religious also attend church. Easter is most prevalent in Mumbai, Goa, and Kerala.